What is the size of your industry? How have sales trended in other industries? What goals does it make sense for your company to set? Perhaps the most important research task is to collect initial data that will help you define your business objectives. Typically survey information is available through secondary sources, but often companies do their own surveys as well to measure satisfaction among customers and ensure that their business plan will meet customer’s needs. Researching all kinds of information about the market and your potential customers will be your best friend when defining business objectives. Once you know your target market you can identify and research your competition. Whether you’re a small business or a large, successful corporation, markets are often changing and new competition is always a potential threat. Researching your market will help you assess your category, strategize, and make the right decisions for your company to gain an edge above your competition. This research can also help you identify what features your competition lacks so you can add add value to your services or brand through real insights. Who are your customers and what do they want? Successful companies research every detail regarding users including their interests, experiences with your product or services, and potential ways to incorporate feedback. User research and testing will help you judge whether your product, advertising, packaging, and brand communication effectively influence consumers. This task is excellent for helping your company make informed decisions. Sample surveys will help you test conceived ideas so you can confidently make decisions. In any given industry, there may be up to hundreds of brands on the market targeted toward the same set of customers. This makes a marketer’s job quite challenging, since every brand needs a different positioning and strategy. Both qualitative and quantitative market research will help guide marketers when developing a brand strategy and analyzing how your company compares to the competition. Effective marketing comes from user research – understand what brand features matter most to your target market and build from there. All industries change over time, so brands must innovate as the market evolves. In order to secure your brand’s relevancy in the market, your company likely must constantly research updates and trends in the market that will influence whether you “perform or perish.” As new competition arises with updated features, focus your innovation efforts on growth opportunities and respond to customer’s changing needs. Remember, if you don’t adapt to the market, someone else will, so staying ahead of the game is a key to success. Businesses often face loss or failure. Market research, user research, and research depending on your industry may help you gain insight into what went wrong. Whether brand awareness is decreasing or sales have fallen, analyzing available data can help you determine possible alternatives to your current strategy and overcome your company’s weaknesses. 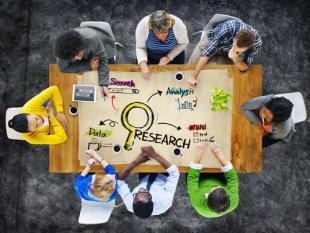 Research is critical not only for identifying problems but also for developing solutions and making decisions regarding the best strategies to carry out. While scholarly research may help your company make decisions (for instance, many psychological studies evaluate the best colors to catch attention or the best font design), there are many other types of research that can dramatically influence your company such as market research and user research. Asking questions, evaluating sources, interviewing users, and testing designs all fall under the research umbrella. How do you make sure your company is on the right track? Research it!